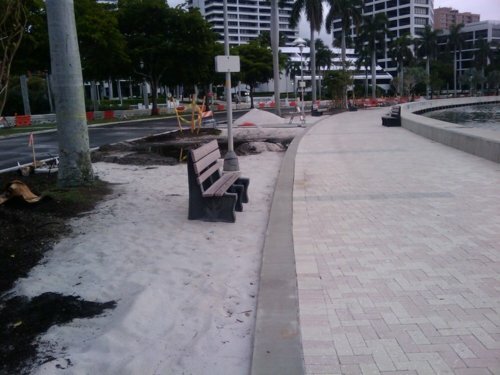 This page will include pictorial updates on the Clematis Street waterfront project throughout the fall of 2009. 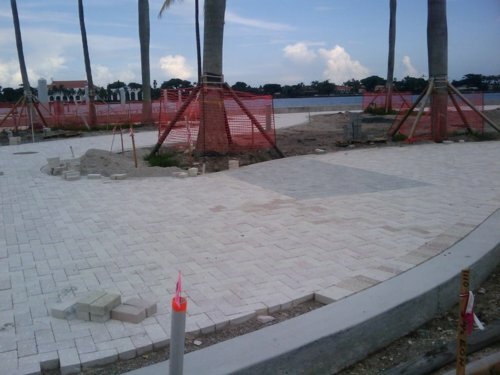 Things are starting to take shape already in late August. 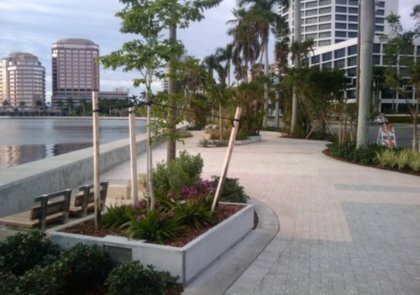 Much of the ripped-up closed off section of Flagler Drive has been re-paved, and nice winding and thicker walkways have appeared along the intracoastal waterway near the three new public city piers. 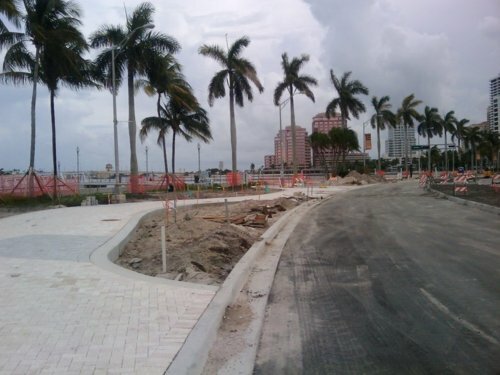 Below are four pictures showing the current state of the project, all taken along Flagler Drive between Clematis Street and Fern Street. 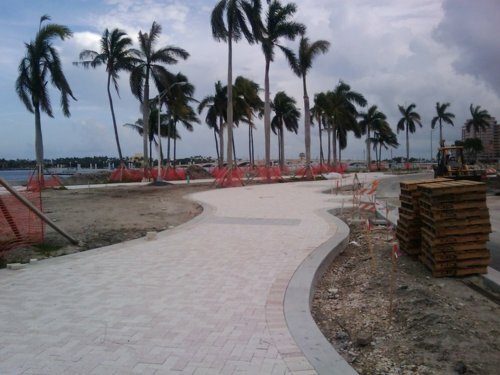 In early September, the waterfront project is progressing. 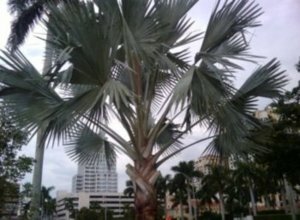 Most of the below pictures were taken in the section between Okeechobee and Fern, closer to Okeechobee Blvd. It appears that they are adding some interesting new features, such as some new types of trees, and a lot of sand. 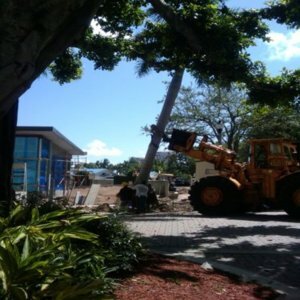 This is just getting started in the part of the project closest to Okeechobee Blvd., and progressing slowly toward the north closer to Clematis Street. 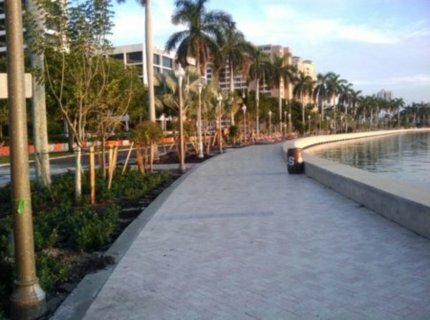 From looking at these pictures you can begin to get an idea of some of the improvements we'll see along the entire downtown's waterfront when the project is done. 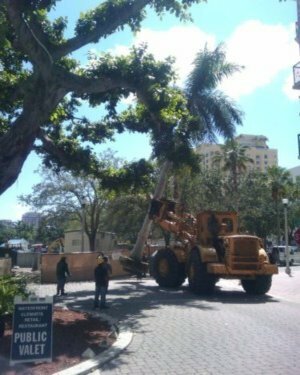 The three pictures below show a large tree being brought in and then placed in its new location along N. Clematis Street in front of the 1 N. Clematis building, as part of the waterfront project. 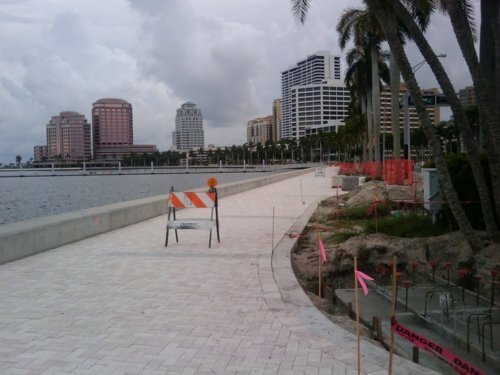 The waterfront project seems to be moving along well as of early October 2009. 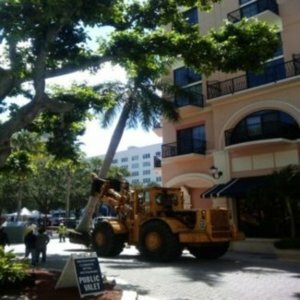 The below picture was taken from about four blocks south of Clematis Street along the waterfront. 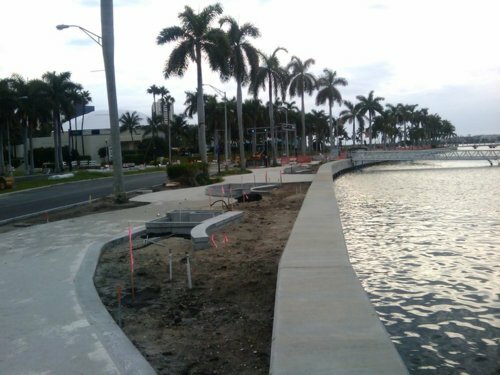 They have filled in a lot of landscaping between the walking path along the intracoastal and Flagler Drive, which gives the path a quite different feel. 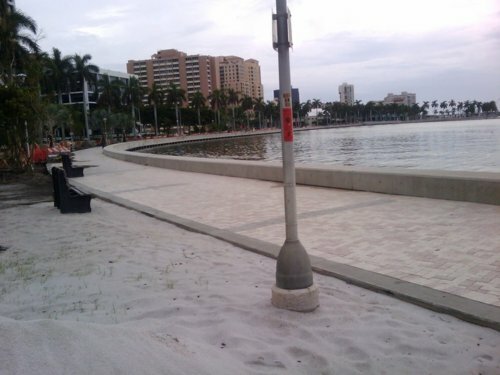 Even though it's not done yet, this picture sort of gives you a sense of what it's going to be like. 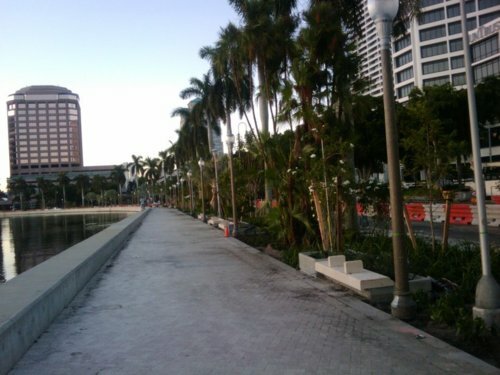 The four pictures below were taken early on the morning of November 1, 2009. 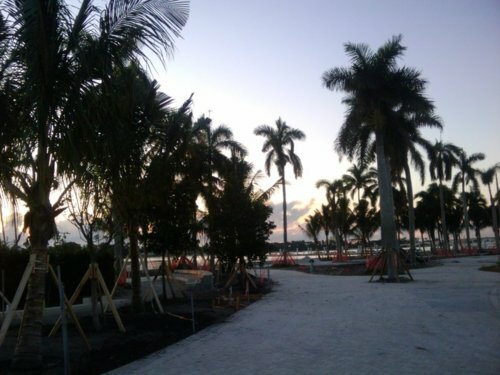 The first one looks south from Fern St. toward Phillips Point. 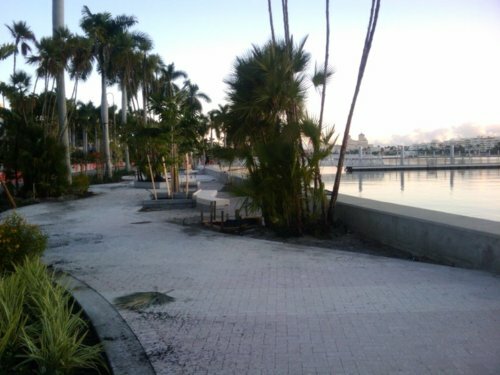 The other three pictures were taken along the intracoastal opposite Clematis Street. 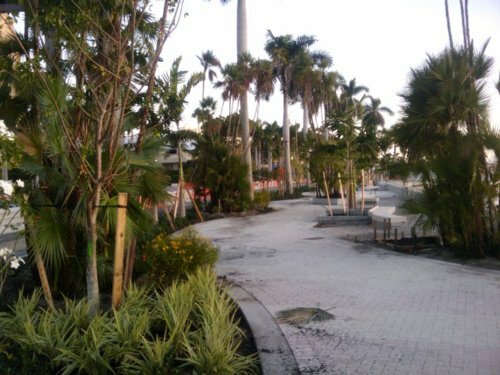 The landscaping is really filling in nicely and these areas are starting to look terrific! 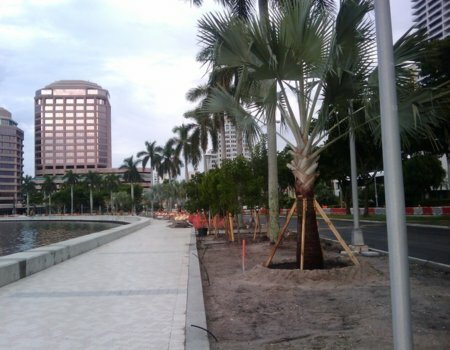 In late December 2009, the landscaping for the waterfront project appears to be complete along Flagler Drive, with the exception of the area directly in front of Clematis Street. 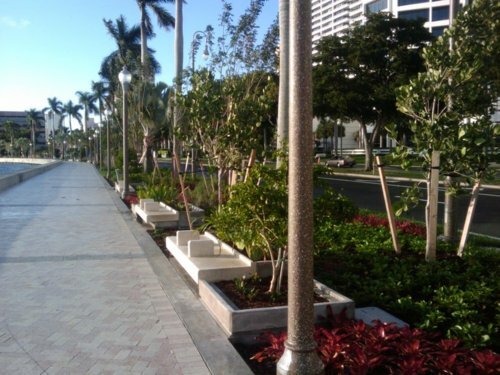 Below are two pictures of the completed landscaping, taken just south of Clematis Street.